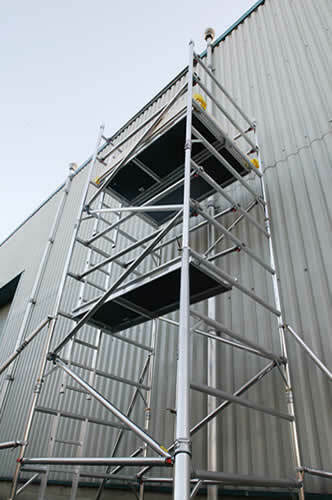 Highest quality scaffold tower hire from just £41.60+VAT per week. 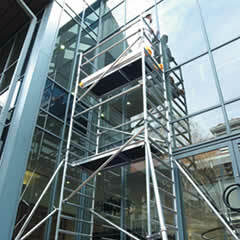 If you are working at height then contact Scaffold Tower Hire London for all your access tower needs. The process couldn’t be simpler; just give us a call and your scaffold tower can be with you at your chosen London location, next day guaranteed ready for work. It means that you don’t have to worry about transportation or even actually getting a scaffold tower on to the site – all you have to do is make sure you are at the right location ready to get cracking. 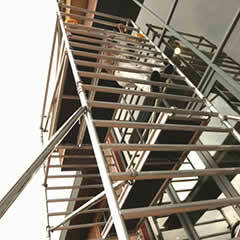 Your scaffold tower will be ready and waiting – that’s a promise. At Scaffold Tower Hire London we can even help you decide on the very best equipment for the job especially if you need to carry out a specialist task on site. Whether you are tackling hallways, carrying out roof repairs or you need to work around an immoveable object such as heavy machinery or a conservatory – we can get you all the right tools for the task in hand. If you think that assembling and dismantling an access tower is too much like hard work then you can think again – it is so easy even a beginner can put together a tower from Scaffold Tower Hire London in about an hour. Each piece of equipment comes with a basic use manual and all our towers have colour coded cup systems so you know straight away if you have assembled it correctly. Experts at Scaffold Tower Hire London always have safety in mind, that’s why every piece of equipment is inspected, checked and pressure washed after every use and all our scaffold towers adhere to the latest health and safety regulations. Don’t be tempted to cut corners and ‘make do’ with equipment that isn’t quite right for the job. With falls from height still topping the list of death and serious injury at work it is simply not worth the risk. Hire an access tower from scaffold Tower Hire London and you will benefit from a number of safety features including toe boards and guard rails providing the perfect stable platform for almost any job at height. So don’t let things grind to a halt for lack of the right equipment. Hiring a scaffold tower has never been easier. Give our professional advisers a call. We have all the access towers and all the answers to help you to get on top of the job, at a surprisingly competitive price. At Scaffold Tower Hire London we can even help you decide on the very best equipment for the job especially if you need to carry out a specialist task on site. Whether you are tackling hallways, carrying out roof repairs or you need to work around an immovable object such as heavy machinery or a conservatory – we can get you all the right tools for the task in hand.